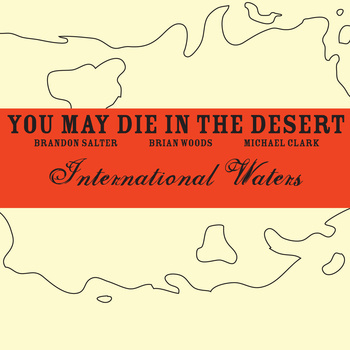 International Waters is the new release from Seattle based band You May Die In The Desert. Just over 55 minutes of music spread across 9 tracks. Four tracks from this release were previously available on a tour CD called International Waters EP, but that has now been upsized to a full LP with a further 4 tracks added, and they retained the name International Waters. I chose two of the newer tracks to play on the show, ‘Hands’ and ‘Six Horses’. I like the way that they split up the album with a very nice piano piece called ‘Interlude(II)’ which lets you catch your breath after the 4 four tracks and sets you up nicely for the last 4 tracks. Not a bad track on this release, lots of great melodies, high energy music that is captured quite nicely, I bet it would be amazing to see this band live. I imaging it would be even heavier and I suspect you would see and feel that energy. Oh and did I mention that they are a trio, such an incredible sound to make with just three members. So Brian, Brandon and Mike have really impressed me with this release, but to be fair to them, i also enjoyed Bears In The Yukon and also Harmonic Motion. So if you like your post-rock played with high energy and like it to be ultra exciting, then this is the band and album for you. You.May.Die.In.The.Desert is a three-piece instrumental band from Seattle, WA. You.May.Die.In.The.Desert have released two albums, Bears in the Yukon, and Harmonic Motion: Volume I (a split record with Gifts From Enola). Bears in the Yukon was originally released in Japan by Zankyo Records and more recently in the USA by The Mylene Sheath. The band has toured extensively in the western USA and had the opportunity to tour Japan in June 2007. In 2010, they self-released an EP, titled “International Waters E.P.”. Their first official full length LP, International Waters, is due to be released in August of 2012. They will be touring the west coast in support of the new album along with many smaller regional tours. This entry was posted on October 17, 2012, 9:50 pm and is filed under Playlists. You can follow any responses to this entry through RSS 2.0. You can leave a response, or trackback from your own site.